Vivobarefoot, the minimalist footwear brand, is reviving ancient sandals designed by the San bushmen of Namibia. Sometimes ancient designs outdo the new. According to the Ju’/hoansi people of Namibia, that was the case for their sandals made from eland (a type of African antelope) leather, originally designed countless generations ago. Made for the harsh climate of the Kalahari Desert, sandals of the San bushman have a simplistic but rugged design. The San bushmen were and are persistence hunters and wear the sandals while running and tracking their prey. Unfortunately, the craft has since declined. 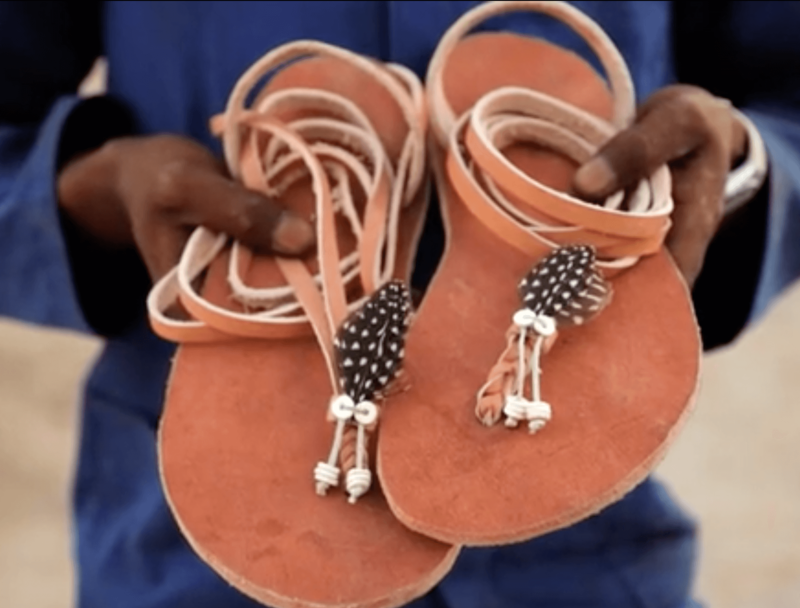 The campaign to bring back the ancient sandals and help the San people is being done on an entirely modern platform – Kickstarter. To make the project a reality, Vivobarefoot founder, Galahad Clark, along with a team consisting of a biomechanics expert and conservationists traveled to the Kalahari Desert in Namibia. It was there that they met with the native San bushmen and the San-dal project was born. 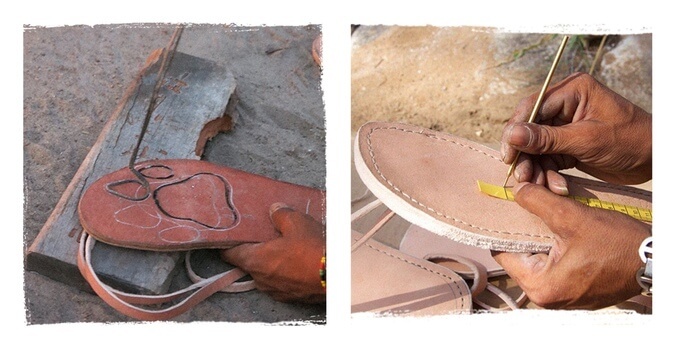 Each sandal is made by hand by a San artesian. The sandals follow the same design used for centuries, passed down through the generations. The men’s version costs £100, which equates to approximately $150. The women’s version costs £120, or around $170, and includes removable decorations made from ostrich eggshell beads and guinea fowl feathers, giving the sandals a subtle feminine touch. 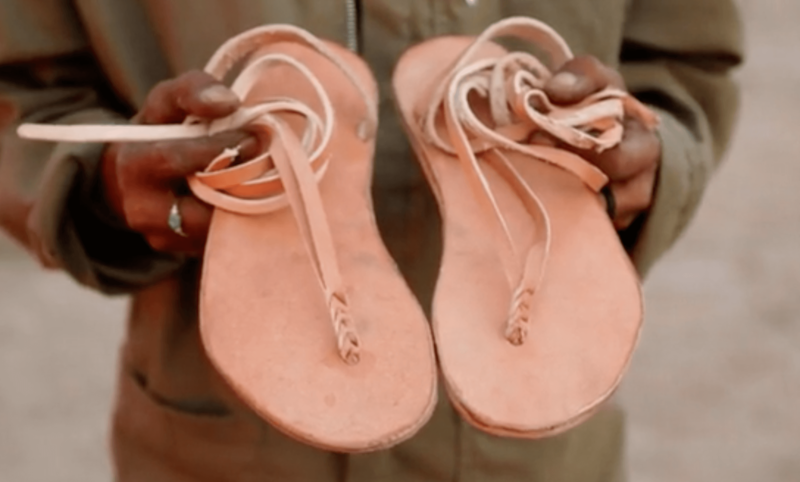 By backing the project on Kickstarter, you get a pair of sandals and help the San bushmen. Several countries have their own ancient footwear. The native Mexicans wore the Huarache, the Romans had Caligae, etc. 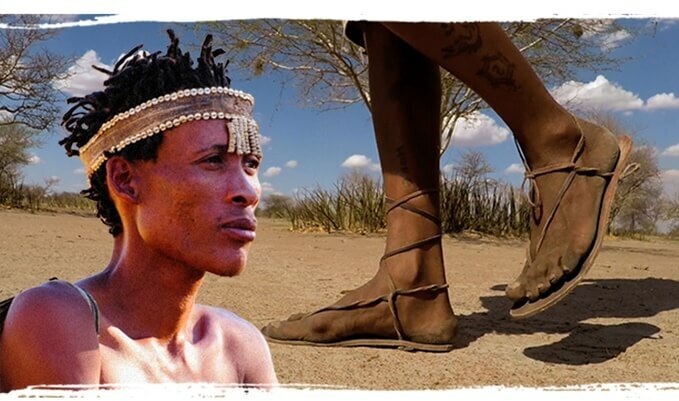 Why did you choose Namibia and the sandals of the San bushmen? The bushmen of the Kalahari are arguably as close to original humans as it gets. Humans did not leave Africa until 70k years ago where the Bushmen had been running and hunting for hundreds of generations before this. We originally went there to witness the last place on earth where the running hunting is still practiced and see natural human movement in its purest original form—the sandal project was born when I realized that they were losing their original craft and starting to wear second hand charity shoes, that were poorly fitting and clearly ineffective. When traveling, it’s often difficult to get past the tourist attractions and see the real culture of the destination and meet locals. How were you able to connect with the local Ju’/hoansi people? We went with people that had been travelling to the Kalahari for decades and have actively engaged with the San Bushmen communities for years. So we were welcomed into their communities as trusted friends (they are rightly suspicious of visitors coming and promising this and that and then not delivering anything). What role has travel played in the launch and preparation for the Kickstarter campaign? What were your experiences in the Kalahari Desert and Namibia? The project simply would not have happened if we had not gone there. We travelled for nine hours by car from Windhoek and then drove around for hours in the area looking for the last people that could do the Running Hunting. It was then a chance meeting with Aleksandra Orbeck Nilsen in a truckers cafe that created the partnership to deliver the project. It was through hanging out and talking with the bushmen in their homes and hearing their stories that the San-dal project was born. I was interested in footwear and talking to them about it and it nearly all came ‘from’ them. I think my last pair of non-Vivobarefoot shoes disappeared about three years ago! It very much depends what climate I’m going to. For the desert, it was, of course, our desert boot—the Gobi. In hot climates, I often wear our sandals, Eclipse, and I always take a pair of Motus as a general ‘sports’ activity shoe— good for a run, the gym, tennis, or any other activity. If I’m going to a business meeting, I wear the Lisbon (see image below). 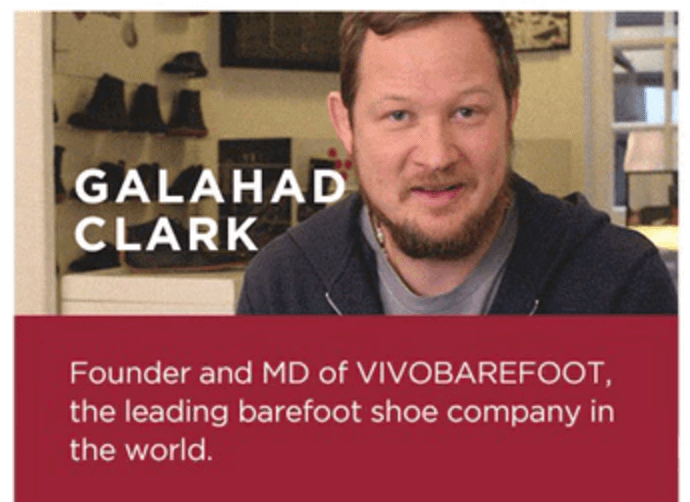 Vivobarefoot is a relatively new company. What direction do you see Vivobarefoot going in the next 5 years? Any new potential products you’re able to share about? We have several exciting projects in the pipeline including—genuine Jungle and desert proof shoes, a ‘smart’ shoe, and an indestructible shoe that we call ‘the super shoe’. We absolutely want to make the best barefoot shoes in the world and with barefoot as our gold standards are constantly innovating to provide a purer ‘barefoot’ experience (in shoes). Making our supply chain more sustainable is also a constant source of innovation. I’ve come across a lot of people who are skeptical about barefoot footwear and the ‘barefoot’ idea. 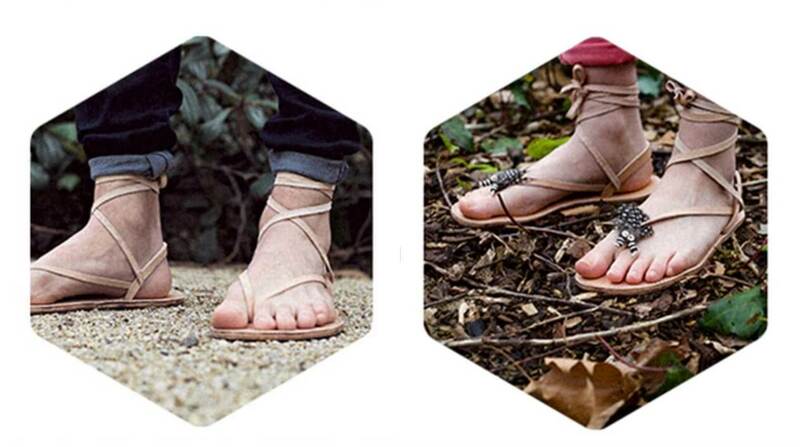 What would you say to those who are not (yet) sold on the barefoot/minimalist footwear mission? How would you convert the nonbelievers? It’s easy to have cognitive dissonance as underfoot technologies have been promoted with billions of dollars for a generation now. And to be honest, the transition back Wide, Thin & Flexible shoes (that effectively let the foot do its thing) should be taken slowly. 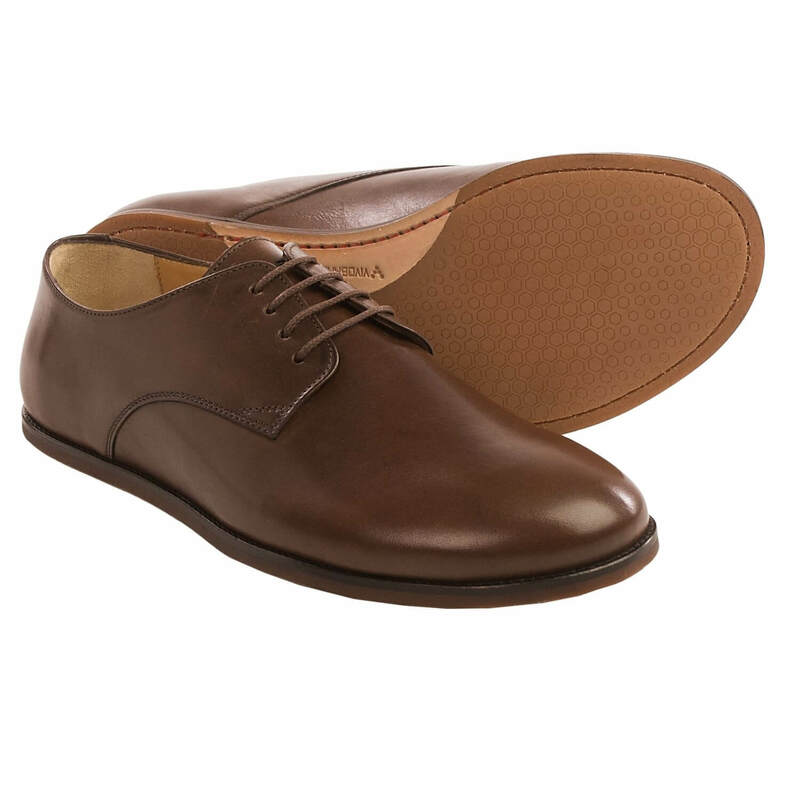 I would say, don’t rush into sports and running, start very slowly walking barefoot around the house, a standing desk and then get a pair of lifestyle shoes and start to use them for walking about in your daily life. What nobody can argue with is that the more you ‘use’ ‘your feet the stronger they get and whatever you want to do in life having strong healthy feet is a good thing. Take your time before you try to build running and exercise into your barefoot life and I would encourage to use your normal sports shoes in the beginning for exercise. Walk before you can run. And then it’s even harder to argue against this in kids. A 4-year-old running around a pool barefoot on hard concrete relaxed and having fun, running and changing direction as fast as they can, is natural movement at its purest form. Then we put their little feet (that are plastic i.e. the bones don’t form until the late teenage years) into non-foot-shaped shoes with a lot of padding and tell them to sit still for the next 15 years. It’s not surprising that most people develop unnatural movement habits. It’s important is to not do anything to get in the way of a kids natural foot development, as every child has the right to stand on their own two feet! 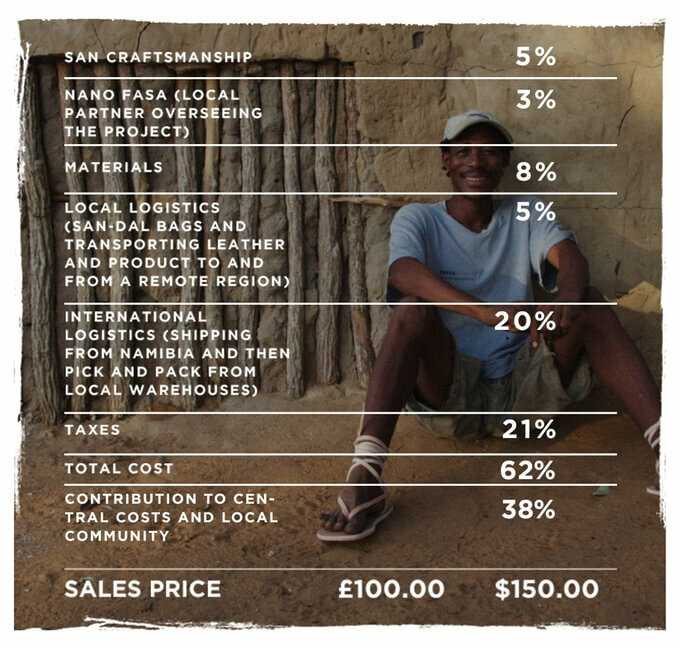 Get a pair of the San-dals and help the San bushmen by backing the campaign on Kickstarter.com.